The recent furor over an unsuccessful terrorist attempt to blow up an airliner is distracting us from considering the possibility of a vastly more destructive terrorist act: exploding a nuclear weapon in a heavily-populated area. Such a disaster -- which would kill hundreds of thousands of people -- is not a remote possibility at all. Although terrorist groups do not have the fissile material (that is, material capable of sustaining a nuclear chain reaction) necessary to build nuclear weapons on their own, they have been trying to obtain such weapons, either by purchase or theft, for decades. According to the U.S. government, Osama bin Laden sought to acquire nuclear weapons at least since 1992. Not only have there been dozens of thefts and sales of fissile material to potential terrorists (all of whom were supposedly arrested), but a significant number of nuclear weapons have been "lost" by nuclear-armed nations. In addition, if either nuclear weapons or fissile material were available to overseas terrorists, it would not be very difficult to smuggle them into the United States. In 2004, when Dr. Graham Allison -- founding dean of Harvard's Kennedy School of Government and a former top Pentagon official -- published his classic study, Nuclear Terrorism: The Ultimate Preventable Catastrophe, he argued that if governments continued their past policies, a nuclear terrorist attack was inevitable. The problem, as he saw it, reflected a combination of terrorist activity, the ease of smuggling weapons across U.S. borders, and the accessibility of nuclear weapons and fissile materials. Unfortunately, not much has changed since that time. Terrorism, of course, shows no sign of disappearing. Even if the "war on terror" produced a significant decline in terrorism (which it shows no sign of doing) and even if proper intelligence and police work reduced the number of terrorist activities, some terrorist acts almost certainly would continue, as they have for centuries. Furthermore, as we have seen in the case of immigration, securing U.S. borders is not an easy task, and perfect security seems unlikely to be obtained. But what about the third leg of the problem: the accessibility of nuclear weapons and fissile materials? Not much has been done about this. But a lot could be done. Allison focused particularly on securing fissile material. As he put it: "No fissile material, no nuclear explosion, no nuclear terrorism. It is that simple." He explained: "There is a vast -- but not unlimited -- amount of it in the world, and it is within our power to keep it secure." Actually, in recent years there has been a tightening up of governmental controls over fissile material. Also, there has been significant interest by the U.S. government and others in negotiating a Fissile Material Cutoff Treaty, which would ban the production of fissile material for nuclear weapons. During the 2008 presidential campaign, both Barack Obama and John McCain endorsed such a treaty, and since then both have spoken out in favor of it. Then, of course, there is the possibility of eliminating the vast stockpiles of nuclear weapons accumulated by nine nations. At the moment, there are some 23,000 nuclear weapons in existence (mostly in Russia and the United States) -- ripe pickings for any would-be mass murderer. Any significant reduction in their number would significantly reduce the opportunities for nuclear terrorism. And their elimination would wipe out these opportunities entirely. To draw upon Allison's phrasing: no nuclear weapons, no nuclear explosion, no nuclear terrorism. Of course, there are other good reasons to eliminate nuclear weapons, as well, including the danger of nuclear war. Doubtless this point will be on the minds of many government officials and citizens alike as the world prepares for the nuclear Non-Proliferation Treaty review conference this coming May, at the United Nations. The U.N. conference will consider the treaty pledges of non-nuclear nations to forgo nuclear weapons and the treaty pledges of nuclear nations to divest themselves of these implements of mass destruction. Even so, the ongoing danger of nuclear terrorism provides yet another reason to rid the world of fissile material and its final, terrible product, nuclear weapons. Let's not forget that. on the issue of the anti-nuclear terrorism preventive measures, but also to change the accepted by SCIENTISTS technical terms, ... just because the accepted ones don't match his political hegemonic ambitions. It was bound to come eventually and it came sooner than latter:Mr Wolberg pointing the finger to Islamism and its adherents :"....or these same nations( N. Korea and Iran while , strangely enough, failing to bring in Pakistan also) sponsored outfitting of Islamic terror groups with such weapons." -Israel : the latest member of the nuclear club that has proved in both Lebanon and Gaza the capability and will to use the most devastating weapons against non military targets , al Dahia of Beirut and Gaza city, with unrestrained enthusiasm and apparent glee. Any truly genuine, ie non discriminatory, call against the horrors of nuclear weapons should address primarily those who used in the past and those, judging by past but recent experience, more likely to use in the future. That calls for an unambigious stand for universal decommisionning of ALL nuclear weapons and an equally universal outright ban on the production of fissionable mareials. Anything else that falls short of that is but an implicit call to keep both nuclear bombs and the materials out of which they are made in the CLUB for better to threaten and terrorize with! Mr. Wittner reminds me of the wanderer, after a journey of many weeks seeking the way home, finally arrive at the last barrier, a river that must be crossed but within sight of his goal. Frightened of the water, the wanderer decides to not cross but instead to seek the river's source so he can cross on dry ground. Sadly, the river source is a spring weeks away, but in the wrong diretion and he never finds his way to the goal. 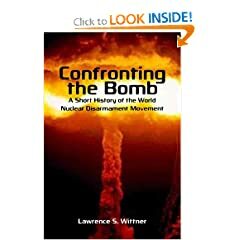 In much the same way, Mr. Wittner avoids the obvious needed action to dissuade nuclear attacks: immediate and overwhelming retaliation. The only direct attacks likely on America or allied nations is via states intending destrucition (North Korea or Iran, both very bizarre states with not much rationality) or these same nations sponsored outfitting of Islamic terror groups with such weapons. As of now, it is most likely that these states military and political leaders realize if they do undertake the first action, hell will fall from the skies. It is also likely that they would not provide a "bomb" to terror groups if only because they would need to provide the delivery mechanism as well, and that such systems (likely large rockets) can be detected, identified and destroyed, again exposing the "evil" states to retaliation. The only real security will arise from very clear messages of destructive retaliation. Sadly, the weakness of the Obama administration, largely the result of the very limited capabilities and suprisingly obvious superficiality of the President, create a dangerous situation for this nation and our allies. Mr. Obama seems incapable of bringing closure to any policy, project or plan and appears less than determined to confront anything except a teleprompter. This can only lead to more aggressive actions by the rogue states and their terrorist clients. Finally, I cannot avoid suggesting that Mr. Wittner (and many others) lrt go of the term "fissile" and use the more accurate "fissionable" in its place. The term fissile is more appropriately used to characterize how particular rocks such as shale, split or part along grains.